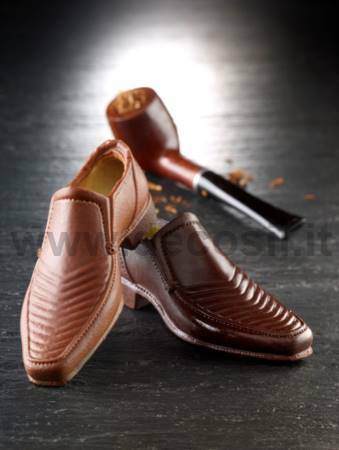 Man Formal Loafer Shoe Mould - Mould to achieve an formal Ioafer shoe of sugar paste or chocolate for the Father's Day. Man Formal Loafer shoe MouldMan Chocolate Shoe Mould - Mould to achieve an formal Ioafer shoe of sugar paste or chocolate for the Father's Day. Mould weight: approximately 0,322 kg. in the moulding procedure to pass the piping bag with the upper edge of the shoe, the toe and the heel; subsequently lock the mould with the use of elastic avoiding to tighten so much to deform or alternatively wrap the mould with the transparent film, leaving free the casting channel.